It sounds like something from Wakanda, the futuristic African kingdom of the hit movie "Black Panther". But "Transaqua" is a very real proposal for a very real problem -- how to replenish the shrinking waters of Lake Chad. It imagines a 2,600-km (1,600-mile) canal from the Democratic Republic of Congo across the Central African Republic to meet the Chari River that feeds into the freshwater lake. Lake Chad -- where the borders of Cameroon, Chad, Niger and Nigeria meet -- has been synonymous in recent years with Boko Haram Islamists, whose insurgency has blighted the region. But climate change and water mismanagement have contributed to a staggering 90-percent decline of the lake's surface area in the past 40 years. The 40 million people who live around and on the lake are among the poorest in the world, with the UN estimating that a quarter are in need of food handouts to survive. The region's worsening fragility has become a recruiting sergeant for Boko Haram. The jihadists have found it far easier to win over impoverished subsistence farmers and fishermen, and to base themselves on many of the lake's islands. At the same time, creeping desertification has forced cattle herders from the lake's once-fertile hinterland, putting them increasingly at odds with farmers farther south. 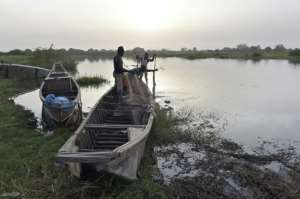 Experts met in Abuja for two days this week to discuss ways to stop Lake Chad from drying up -- and Transaqua, although still in its infancy and facing many hurdles, attracted interest. Proponents argue it is the only way to address an environmental and humanitarian crisis from spiralling out of control. Sanusi Abdullahi, executive secretary of the Lake Chad Basin Commission which oversees the use of water and other natural resources, said they were running out of choices. "Inter-basin water transfer is not an option but a necessity," he said. "We are faced with the possibility of the Lake Chad disappearing and that would be catastrophic to the entire African continent." At the conference, pent-up frustration at a lack of progress on the Lake Chad issue was directed at western countries. Paris-based UNESCO has launched a new $6.5-million (5.3-million-euro) research and conservation programme involving Cameroon, Chad, Niger and Nigeria, as well as the CAR. But Horace Campbell, an African studies professor at the University of Ghana, called the UN cultural and heritage organisation's project a "diversion". "What the French intellectuals have been promoting is resilience and livelihood. But you can't have that without replenishing the lake," he told delegates. Transaqua has been proposed by Italian engineering and consulting firm Bonifica, in partnership with the Power Construction Corporation of China (PowerChina). For Italy, the project, which according to one estimate could cost as much as $14 billion (11.45 billion euros), may help slow the flow of migrants seeking to leave Africa for Europe. "The vision of hundreds of people dying in the Mediterranean sea" had spurred Italy into action, according to Bonifica technical director Franco Bochetto. "In recent years the situation has rapidly changed and what did not seem possible in the 80s has become of interest," he said. For China, the project is an opportunity to deepen its already strong ties with Africa. "We work here for projects and we want to take social responsibility," said Ziping Huang, an engineer at PowerChina. In addition to the funding, the engineering and geo-political challenges facing Transaqua are daunting. The canal would have to cross vast and hugely diverse terrain, through countries mired in a reputation for graft and instability. Critics point out that plans for similar projects elsewhere, such as replenishing the Dead Sea, have not taken off. In the case of Lake Chad, time is pressing, and the initial feasibility study may take at least three years to be completed. Huang said working on such a project given the security situation in the region was "beyond our company's imagination". No-one disputes the situation in Lake Chad is dire. But what is more difficult to agree on is how the four countries whose borders meet on the lake can work together. English-speaking Nigeria for example has long had strained ties with its francophone neighbours, although the countries have come together in a joint regional force to fight Boko Haram. 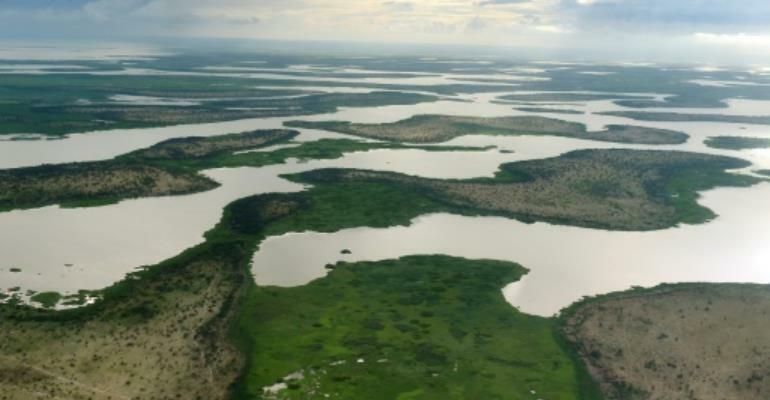 "Lake Chad stands out in its complexity and severity at the moment," said Florian Krampe, of the climate change and risk programme at the Stockholm International Peace Research Institute (SIPRI). "These countries at the end of the day have to cooperate if they want to address these transnational risks, there is simply no other way of doing it. "The question is, are the institutions ready?"